1. pertaining to a trochlea. 2. pertaining to the fourth cranial nerve (trochlear nerve). trochlear nerve the fourth cranial nerve; it supplies muscle sense and the impulse for movement to the superior oblique muscle of the eyeball. See anatomic Table of Nerves in the Appendices. Either of the fourth pair of cranial nerves that originates in the midbrain and innervates a muscle of the eyeball. either of the smallest pair of cranial nerves, essential for eye movement and eye muscle sensibility. The trochlear nerves branch to supply the superior oblique muscle and communicate with the ophthalmic division of the trigeminal nerve, connecting with two areas in the brain. Also called fourth cranial nerve, nervus trochlearis. The 4th of the 12 pairs of cranial nerves. 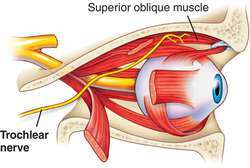 The trochlear nerve supplies one of the muscles that moves the eye-the superior oblique muscle. Contraction of this muscle turns the eye downwards and outwards. the fourth cranial nerve on vertebrates, which innervates the superior oblique muscles of the eye. 2. pertaining to the fourth cranial (trochlear) nerve. semicircular notch in the proximal extremity of the ulna, articulates with the trochlea of the humerus, overhung by the 'beak' of the ulna's anconeal process. a flat piece of cartilage, or loop of fibrous tissue, embedded in the dorso-medial wall of the orbit close to the edge of the orbit; acts as a pulley for the dorsal oblique muscle. the proximal articular surface on the talus, articulates with the tibia.